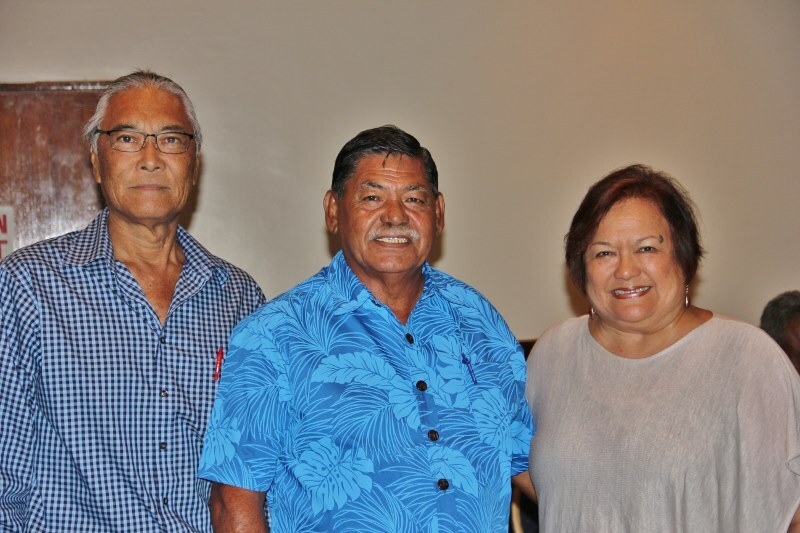 (from left) Council Chair Edwin Ebisui Jr., CNMI Acting Gov. Victor Hocog and Council Executive Director Kitty Simonds at the opening of the 166th meeting of the Western Pacific Regional Fishery Management Council, Garapan, CNMI. COMMONWEALTH OF THE NORTHERN MARIANA ISLAND (6 March 2016) Acting Gov. Victor Hocog of the Commonwealth of the Northern Mariana Islands (CNMI) today asked the Western Pacific Regional Fishery Management Council to work with the Commonwealth to address regulations that impact the people of the CNMI. On behalf of Gov. Ralph Torres, who is off-island, Hocog made his remarks during the opening of the 166th meeting of the Council today at the Fiesta Resort & Spa in Garapan, CNMI. “Before we became a commonwealth and decided to become a family of the great nation of America, our forefathers used our natural resources on sea and land,” Hocog said. 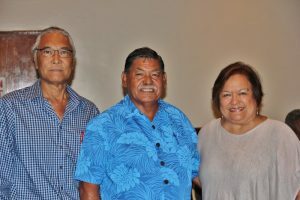 “As we became part of the American family, things changed.” He noted that CNMI has been conserving its resources even before it became a part of the United States. He said the forefathers were mindful of future generations. Hocog listed three items of concern: 1) the 0 to 3 miles of submerged lands and waters around islands of the Islands Unit of the Marianas Trench Marine National Monument (MNM) that have not been conveyed to the CNMI; 2) sea turtles and sharks; and 3) US military bombing of Farallon de Medinilla (FDM). Regarding sea turtles, Hocog said, while he is not fond of eating turtle, “It is sad to hear we have so many turtles around, yet our people cannot even harvest one for ceremonial use.” He said the turtles that hatch in the CNMI travel to the Philippines where they are eaten, while the CNMI people are told to “stay back and don’t touch.” He noted that the Carolinian people in the CNMI have rituals attached to turtles. “The greatest predator is the sharks,” Hocog said, “not the human.” He said they provide hardship to the CNMI fishermen. “For example, if you put 12 hooks down to catch onaga, ehu, whatever it is, you are very lucky when you pick up three out of the 12 on the hook because of the shark infestation around our islands.” He noted that the CNMI is on the verge of developing infrastructure for its expanding tourism industry and that the hotels would need high grade fish. The quality of the fish is seriously compromised when sharks remove the head or body of the fish. Michael Tosatto, the regional administrator for the National Marine Fisheries Service (NMFS) Pacific Islands Regional Office (PIRO), reported that the submerged lands in the Marianas Trench MNM Island Unit will be conveyed to CNMI by a Patent. He said a memorandum of agreement among CNMI, US Department of the Interior and US Department of Commerce outlines coordinated management consistent with the purposes and requirements of the Presidential Proclamations 8335 and 9077. He said the 0 to 3 nm submerged lands at Maug, Uracus and Asuncion in the monument would hopefully be transferred by end of calendar year. Richard Seman, Council member and Secretary of the CNMI Department of Lands and Natural Resources, brought up the broken promise of a monument visitors center. He said recent discussions revolve around who is going to fund the center as Congress never allocated or budgeted for this. When queried by Council Executive Director Kitty Simonds, Tosatto said monument funding includes one to the National Ocean Service (NOS) , principally for the MNM in the Northwestern Hawaiian Islands (NWHI), and the other of around $3 million is shared by NOS and NMFS. PIRO uses its funds for staff and contracts. None is directly allocated to the territories. There is no initiative to increase the funding. The monument has not been identified as a high need. Council members also brought up concerns about lack of co-management of the monument in American Samoa and lack of enforcement plans to address the proposed expansion of the NWHI monument. 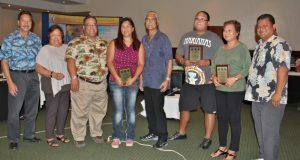 During the meeting, the Pacific Islands Fisheries Science Center, Western Pacific Regional Fishery Management Council and CNMI Department of Lands and Natural Resources recognized seafood vendors who are voluntarily assisting the Council and NMFS with collection of fishery data in CNMI that will help inform management of CNMI’s fisheries. The Council recommended that a) NOAA General Counsel for Enforcement Section work with the American Samoa Government to determine the ability to access the funds from violations at the Rose Atoll MNM and the National Marine Sanctuary of American Samoa; b) NOAA Office for Law Enforcement and US Coast Guard determine the quantity and trends for US-flagged vessels reporting incursions by foreign vessels in the US EEZ in the Western Pacific Region and provide a report to the Council; and c) the US Coast Guard provide more frequent patrols of the US exclusive economic zone (EEZ) around the NWHI. The Council will also work with the Federal fishery enforcement agencies to determine additional cost-effective methods to increase enforcement of the NWHI EEZ. Regarding CNMI fisheries, the Council will work with its CNMI Advisory Panel members and Mayors offices of Rota and Tinian to begin the process of developing community-based fishery management plans for each island. It will provide the CNMI Advisory Panel assistance in exploring the development of a marine biosecurity plan to protect CNMI fisheries resources. The Council will hold a workshop with its advisory body members, the CNMI and Guam governments and representatives of Palau, Federated States of Micronesia, Marshall Islands, Philippines and Japan to share information and management regimes, if any, and to discuss green sea turtle populations in the region. The Council will also explore options for training CNMI fishermen about fisheries methods and marketing so the fishing community can take advantage of increased tourism and development in the CNMI. The Council will recommend NMFS a) provide a training workshop for fishermen, vendors, conservation officers and other stakeholders on the federal bottomfish and federal shark regulations; b) conduct an economic survey in the CNMI to determine the expense and expenditure differences in fisheries between Saipan, Tinian, Rota and Guam to determine the differences between the islands as well as between the fishery sectors; c) design and implement a socioeconomic survey to determine the fisheries opportunities and impacts of increased recent development in the CNMI, given the new hotels and casinos in Saipan; and d) review the Mariana Trench MNM to determine any impacts to fisheries in the Marianas since the proclamation. The Council will work with the Department of Defense to reduce or mitigate the impacts on fishing at FDM and to improve communication with the community and local officials on Tinian regarding the Department’s recent activities and data collection on the island. The Council will continue its deliberations 8:30 to 5 p.m. tomorrow at the Fiesta Resort in Garapan. On Thursday and Friday, the Council will reconvene in Guam at the Hilton at Tumon Bay. The public is invited to participate in these meetings as well as Fishers Forums to held 6 to 9 p.m. tonight at the Fiesta Resort, CNMI, and Thursday night at the Hilton Guam. 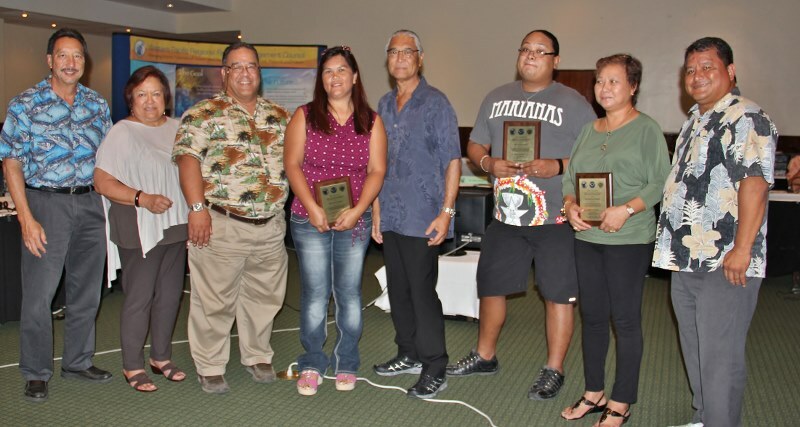 The Fishers Forum topic in the CNMI is on data, and the Forum in Guam will focus on mapping fishery resources. For more information, go to www.wpcouncil.org or email info.wpcouncil@noaa.gov.